Best for an EC12 or any RC Boat ? The EC 12 is my favorite RC Sailboat. It is modeled after the 12 meter yacht "Heritage" and shares the same graceful lines. Being a larger model, it sails with the beauty and grace of a full sized boat. The class is blessed by numerous suppliers, who offer beautiful one design hulls, precision cut sails, spars and rigging. Over the past few years electronic developments have also enhanced the class. Powerful sail winches and digital, high torque rudder servos and programmable 2.4 gHz radios have improved the sailing experience and allowed precision and programmable control of the boat under sail. 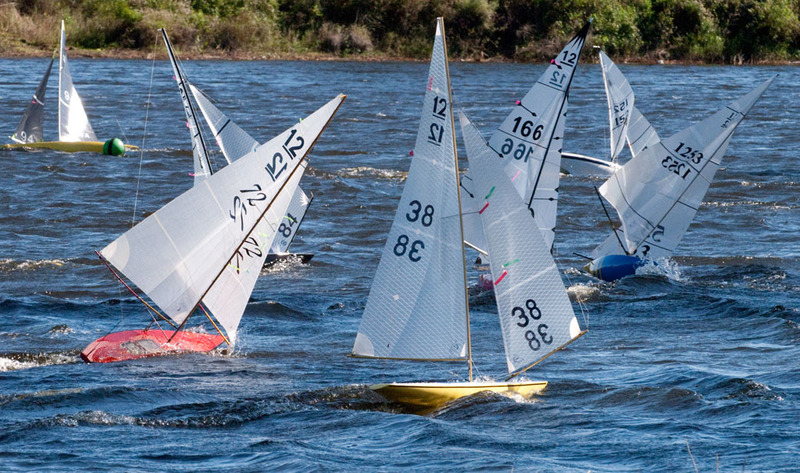 The class is extremely well organized and has numerous large regattas throughout the year . 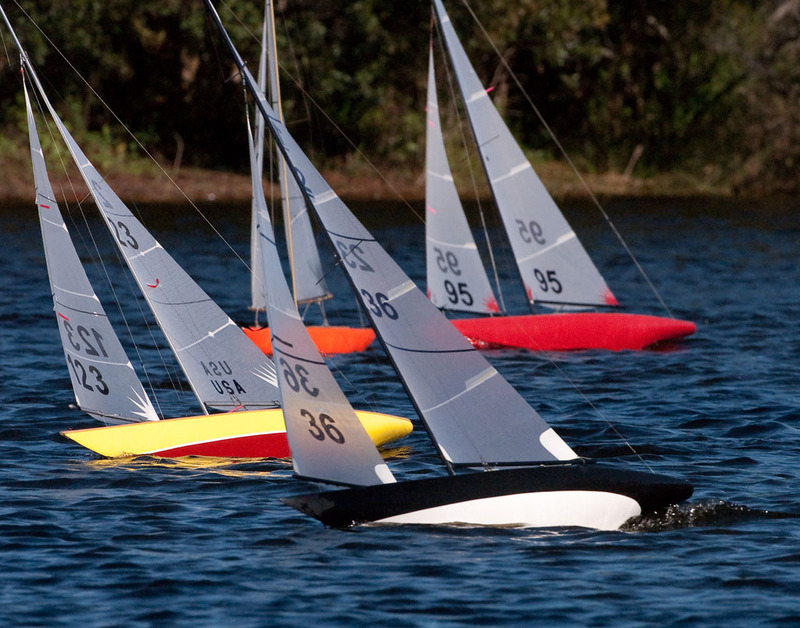 I personally travel to seven regattas in Florida. With many boats participating, control and dependability are important. In the picture below, #38 is my boat. I upgraded most of the electronics in my boat to include a new RMG sail winch, a digital, high torque rudder servo, and installation of a 2.4 gHz radio. These combined upgrades gave noticeable improvements in control, but with some loss in operating time and dependability. The power demands of these winches can be quite high. The 2.4 gHz radio receivers cannot tolerate momentary voltage drops. After a couple hours of sailing with the traditional 6 volt 2000 mAh nickel metal hydride (NiMH ) battery, I would occasionally suffer uneven winch performance or worse, receiver drop out, due to low voltage. Although rated differently, the lithium iron (LiFe) battery and NiMh battery start at about the same voltage ( 6.5 volts). Where the LiFe battery is greatly superior is that it maintains that voltage as it discharges. The LiFe battery maintains a higher voltage during discharge, but does not require a voltage regulator or step down circuit . This consistently higher voltage gives the servos more power. Additionally, when a heavy load is placed on the servos, the LiFe battery maintains its voltage better and can deliver energy much quicker than a NiMh battery. • More powerful servo operation at slightly higher speeds..
• No need for a voltage regulator. Just plug in the battery and go. • More consistent servo operation over a longer time. • No receiver drop out due to low voltage. • Quick recharge time ( 15-20 minutes). • No need to " top off" . LiFe batteries hold their charge. • Similar cost. Lighter weight. What about Lithium Polymer (LiPo) batteries? A fully charged LiPo ( lithium cobalt oxide ) battery has a voltage over 8 volts. A RMG winch and most 2.4 gHz radio receivers can operate at this voltage. However, most other ( 6 volt ) servos cannot tolerate such a high voltage. There are two ways to deal with this. One way is to power the receiver and other servos through the voltage regulator built into the RMG sail winch. However, the output voltage is only 5 volts. A moderate torque analog rudder servo, will operate at 5 volts, but with lower power. A high torque digital servo may exceed the current carrying capabilities of the voltage regulator. Another way is to run a second circuit through a separate higher capacity 6 volt regulator. But then you have one more piece of electronics that might have a problem. Furthermore, some voltage regulators I used generated electrical noise, that caused radio reception problems. One final option is to change all servos to the newer higher voltage ( 7.4 volt ) servos. Then all servos and receiver would be operating at LiPo voltage. This option just wasn't practical for me. Lithium is the lightest of all metals. It is very reactive and has a high electrochemical potential. In many ways it is the perfect metal for producing a lightweight and compact power source. Free elemental lithium will react violently with water. Early lithium cells contained elemental lithium, but were considered too risky for most commercial applications. Today all cells are made with no free lithium. The lithium is bound to other chemicals to prevent any reaction with water. So this is not a concern for our marine application. Today, lithium batteries are broadly used in consumer electronics, probably accounting for 75% of the total. For model applications today, the most common lithium battery is the " lipo " or lithium polymer battery based upon lithium cobalt oxide ( LiCoO2 ). Lipos have a rated voltage of 3.7 volts per cell, so a two cell would have a voltage of 7.4 volts. These batteries are compact, light weight can release lots of power in a short period of time. Lipos are commonly used in model aircraft and cars. The 7.4 volts cannot be tolerated by a standard servo rated at 6 volts. More problematic with Lipos is there limited thermal stability. Lipos can get very hot and create fire if overcharged or short circuited. Also, Lipos can begin to swell or generally degrade if stored above room temperatures. Lipos can also swell or heat up if physically damaged. I used Lipos for three years without incident. However, I was very careful with their use and respected the special care and handling these batteries require. A more recent development for models has been Lithium Iron Phosphate (LiFePO4) batteries. Phosphate chemistries possess superior thermal and chemical stability which provides better safety characteristics. These batteries ( commonly referred to as LiFe batteries) were developed with the idea of providing a power source for automobiles, where the need for fire and crash resistance were required. The single cell of a LiFe battery is typically 3.3 volts, so a two cell battery has a voltage of 6.6 volts. This voltage gives the standard 6 volt servo extra punch, but can still be easily tolerated by the 6 volt servo. LiFe batteries are slightly larger and and just a tad heavier than Lipos, but still much more compact and lighter than the traditional NiMh battery. The compact size and lower weight of Lithium Batteries can be a significant advantage for RC boats weighing less than 10 pounds. From a power standpoint voltage and amperage discharge are important. Think of voltage as the size of the pipe carrying energy out of the battery. Think of amperage as the speed of flow of energy out the pipe. So to get power, you want a bigger pipe with energy flowing (amps) more quickly out of the battery. The technical measure of power is Watts, which is Volts x Amps. The higher voltage of the LiFe and LiPo is evident, but what is remarkable is the amperage that can flow out of a LiFe or LiPo battery. I could not find a rating of amperage for the NiMh battery. I have read it is around 1 - 2 amps, not very much compared to the other types. Just another comment about the weight differences of the batteries. The NiMh battery is pretty standard with its 5 AA cells. They are all pretty much the same size and weight. Lithium battery types are made in a variety of sizes. A 6.6 volt LiFe battery is available in a range is sizes and weights running from 1 to 7 ounces. So depending upon your power requirements, it may be possible to save a lot of weight by going to a LiFe battery. A battery is tested by discharging it a specified rate. This is called putting a " load " on the battery. I have a battery charger that will also discharge batteries at specified load ( amps or energy flow rate ). Battery performance is measured by monitoring voltage as the load is applied. When a load is applied the voltage of a battery initially will drop because of the internal resistance to energy flow within the battery. Internal resistance varies with battery chemistry and construction technique. As the load is applied over time, the voltage of the battery will slowly drop as more and more energy is withdrawn from it. Most desirable is a battery that maintains voltage. The NiMh and LiFE batteries start at about the same voltage. However, the voltage of the NiMH battery falls steadily as energy is withdrawn. After 2 1/2 hours the NiMh battery voltage has dropped to 5.5 volts. The LiFe battery voltages drops only 0.1 volts to 6.4 volts. After two hours, the difference between the NiMH and LiFe battery is nearly one volt. This difference would result in a dramatic difference in speed and power at the servos. The LiPo voltage starts at a whopping 8.1 volts and declines to 7.4 volts. Although a RMG sail winch will run well up to 9 volts, this voltage range is too high for any 6 volt rudder servo and would have to be controlled by a voltage regulator. One option is to power the receiver and rudder servo through the voltage regulator in the RMG sail winch. However, the voltage output of this regulator is only 5 volts, so the rudder servo, will operate relatively slowly. Additionally, if the servo is a higher torque digital servo or if additional servos are used on the boat, the current demands will probably exceed the capability of the voltage regulator. This will cause a drop in voltage below 5 volts, and then the receiver will probably shut down. A second option is to run a second circuit through a programmable voltage regulator that has higher amp capabilities. These regulators are available, but cost nearly as much as a battery and add another dimension of electrical complexity. I went this path for a awhile, but never achieved a system that was 100% dependable and simple to maintain. One final approach for use of a LiPo system would be to replace the rudder servo ( and any other servos ) with the new " high voltage " ( 7.4 volt ) servos designed for use with LiPos. This approach wasn't practical for me. I have other boats where servos are used that just are not available in the high voltage type. I wanted to use only one battery chemistry across all boats. The previous testing was done with a "load" representing an average energy demand. What actually occurs, of course, is that energy demands are fluctuating as servos are started and stopped. An RMG winch can momentarily draw well more than 5 amps every time the servo motor starts. A digital rudder servo can draw 2 amps under high load conditions. At full charge, the NiMh battery voltage would stay just above 5 volts when a 2 amp load was applied. However, after average discharge of .4 amps for an hour or more, the NiMh battery would drop below 5 volts immediately when a 2 amp load was applied. If voltage drops below 5 volts on your boat, the sail winch will go out halfway or your receiver will cut out. Both undesirable. The LiFe battery is able to deliver the 2 amps and voltage holds at 6 volts. With 6 volts, the receiver will stay on and you will have plenty of power to run the sail winch and other servos. An additional convenience factor of the LiFe battery is that it can also accept energy at a very high rate. After sailing for 2 or 3 hours, the battery can be recharged in 15 - 20 minutes. I have a couple of different sized LiFE batteries for different boats. What I do now is just leave each battery partially discharged after use. Then I recharge just before I go sailing. While I am loading up the boat in the car, I just recharge the battery I am going to use. By the time I get boat, chair, sails, etc. in the car, the charger beeps ( indicating full charge ) and I'm ready to go. For RC sailing, the Lithium Iron Phosphate (LiFe) battery offers an attractive alternate to the traditionally used NiMh battery. The voltage of the LiFe battery remains essentially constant during discharge at 6.5 volts. No voltage regulator is required. LiFe batteries are " plug and play". When heavy loads are applied to bring in sails or turn the rudder in heavy air, battery voltage will drop only slightly, so adequate power will be available. With a LiFe battery you should notice improved boat control in a wide range of conditions. Remember the picture of EC12 # 38 earlier in this article? It was under full control while other boats were broaching. I guess you could say the skipper was just doing a great job....Or maybe the lithium battery power helped improve control in this situation. Battery maintenance is simplified with a LiFE battery because recharge only takes 15- 20 minutes. If not used immediately after charge, LiFe batteries do not self discharge. No topping off is required. LiFe batteries are more compact and weigh less than NiMh batteries. LiFe batteries are thermally stable compared to LiPo batteries. The chance of overheating the battery or causing fire is limited. But remember, always use a LiFe charger with a LiFe battery. LiFe batteries are available for most transmitters, too. So it is possible to really simplify and use LiFe batteries for everything. With LiFe batteries I have found that battery charging and maintenance are greatly simplified. Boat control and servo responsiveness are greatly improved. While sailing, I don't even think about batteries, voltage, or state of charge....and that's the way it should be.